Summer holidays in Châtel offer up a huge variety of activities and a wealth of interesting places to visit. While this very French town in the northern Alps of the Haute Savoie, not far from Geneva, is well known for skiing, walking and mountain biking there are lots of other exciting things to do for children, families and adults alike. In this you will find a wealth of 'Insider's knowledge' that is not readily available and collated elsewhere. While the Châtel Tourist Office and guide books indeed offer lots of useful information, we think this is something extra. We hope it helps you enjoy a fabulous holiday. In summertime the French and Swiss Alps are probably most closely associated with the walkers and hikers exploring the beautiful alpine meadows and mountain tops. The village of Châtel is located right at the top of the Abondance Valley just across the border from Switzerland, providing easy access to the whole mountain area. There are over 7000km of long distance trails marked by coloured posts that traverse the across the entire French alps, offering short walks and pleasant day long hikes up to multi-day expeditions. Many of the chairlifts of the greater Portes du Soleil ski area run over the summer months, making it very easy to for everyone to get into the mountains. 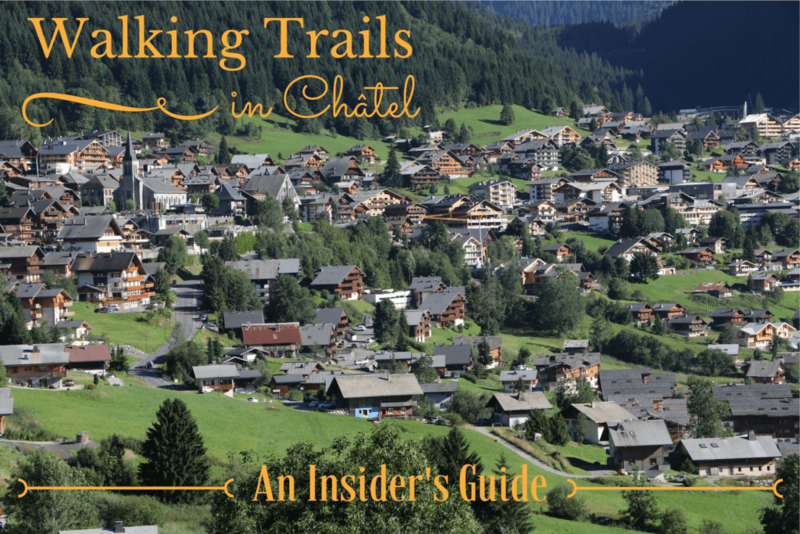 Châtel offers easy nearby access to the many walkable sides of Mont de Grange, the mountain which the village faces, the lifts of Pré-la-Joux at the top end of the valley and Super-Chatel, above the centre of the village. Lakes, forests, alpine meadows and chalet restaurants are at your disposal. There are also lovely routes running from the middle of the village into the mountains above. The close proximity to Morgins means the neighbouring lifts and mountains are within easy reach too. For the more adventurous there is the always the ascent and traverse of the famous Dents du Midi. If you are interested in planning a longer expedition these refuges are located on the high mountains around Châtel offering overnight accommodation and food. To add a twist to your hiking you could incorporate hiking with singing and yoga! If you are in need of equipment there are plenty of shops in the village, such as Intersport, that are well equipped with clothes, boots, rucsacs and the like. The main map for the area is the useful Morzine Massif du Chablais (sheet reference 3528ET) which can be found on Amazon and the Carte de Randonnée publishers. The Tourist Office also lists a number of guides to help you plan and navigate a days walking. Below we suggest some interesting route options that cover all experience levels. Obviously, as for any outdoor activity, ensure that you are adequately prepared and experienced! A pleasant walk for a family is around Lac des Plagnes on the side of Mont de Grange. Paths lead around the lake and up into the mountain as well. In summer the Bar du Lac "Chez Remy" offers refreshment by the water. To get there from Châtel you drive down the valley towards Abondance, turning left across the River Dranse just after the Tourist Office. Carry on up the valley with a tributary to the Dranse on the right until you come to the Lake. It is about a 25 minute drive. By taking the Morgins chairlift La Foilleuse (five minutes drive from Châtel and in the centre of Morgins) up to the high meadows of Switzerland you can enjoy walking along the high peaks and take in the view of the snow capped Dents du Midi. It is an easy outing for families and children with the benefit of allowing you to wander along the mountain top with only a modest amount of additional up and down. If you are after a longer walk, loop round back into the Morgins valley through the forest to the west. This has a pleasant reward in the form of Cantine de They as you near Morgins. A fun and pleasant stroll for the all the family starts from near the stables. After entering Morgins from Châtel, turn right just before the road bends left and descends into the village proper. Rather than driving on up the Route de Chésery, from the little car park here you can walk through the tall pine trees on the path running beside the river. There are several picnic benches and covered eating areas by the path too. Entertainingly for a walk in the Alps, there are scale representations of the sun and planets of the solar system on the way. Walking underneath an arch representing the sun near the car park you can march on, the distance to scale, all the way out to pluto! Another incentive is the Cantine de They, about 45 minutes to an hour's walk up the valley. A more energetic challenge, but still quite acceptable for families starts from the village itself (our youngest daughter managed aged 5). Either walk or drive to Petit-Châtel passing the chairlift and Hotel Arc-en-Ciel on the right, parking a few hundred meters on the in marked bay by the little chalet Nid-Zut. Follow the road above and behind the chalet out on to the mountainside. From here there is a rewarding, albeit uphill, walk to the Col du Saix. Unfortunately the Chalet de Théo restaurant which you pass is closed in summer but with a snack in your rucsac you can still pause for a bite to eat and survey a wonderful vista. You can continue the walk on to the top of the ridge and the Col de Recluaz if you are feeling energetic. From the Super Châtel chair lift in the middle of the town, and you can choose to walk from either the bottom or the top of the gondola, there are walks through the trees and over the meadows. An easy route runs up the hill from the top of the gondola. Walk across the 'border' to Switzerland and on to the Chalet Neuf restaurant. Extend the return route by walking all the way down on the marked paths through the trees. A harder climb is to turn left at the top of the gondola and climb up the Morclan plateau for a view right across the Alps, taking in the Dents and Mont Blanc to the south. Drive right to the top of the valley and from the large carpark beside the Perdrix Blanche restaurant there are some walks in the forests of Pré-la-joux. The chairlift Pierre Longue runs in the summer months and will whisk you up to Plaine Dranse, with its collection of mountain restaurants. The next chairlift, Rochessons, will take you up to the summit (and the Fantasticable). This area has so many options to explore. You can use these lift or instead drive up to Plaine Dranse, and then on slightly to the north of the lift system to the Col de Bassechaux and the lovely La Haute-Bise restaurant. There are lovely trails running from here, over looking the Ardent valley and running up towards the summit of Mont de Grange. Take your pick! The tour around Mont de Grange is a full day hike for fit, experienced individuals and will provide a wonderful view of the different sides of the region. Pack well and leave early from the village. There is no need to drive as this 33km walk from the village takes you full circle of the imposing mountain facing the village. It is possible to climb from one end of the Dents du Midi to the other in a day although a longer expedition is possible too. This interactive map shows some of the main routes. The Tour des Dents-du-Midi website provides a great deal of useful information, guides for hire, accommodation and booklets to help prepare you for the expedition. At Clarian Chalets we offer luxurious summer as well as catered winter ski accommodation in the lovely village of Châtel. We love introducing families to the region that we have discovered and we have a simple goal for your holiday. Contact us at [email protected] or visit our website for more information. We are always delighted to help.